Interferential current (IFC): is characterized by the crossing of two electrical medium, independent frequencies that work together to effectively stimulate large impulse fibers. These frequencies interfere with the transmission of pain messages at the spinal cord level. Because of the frequency, the Interferential wave meets low impedance when crossing the skin to enter the underlying tissue. This deep tissue penetration can be adjusted to stimulate parasympathetic nerve fibers for increased blood flow. Interferential Stimulation differs from TENS because it allows a deeper penetration of the tissue with more comfort (compliance) and increased circulation. 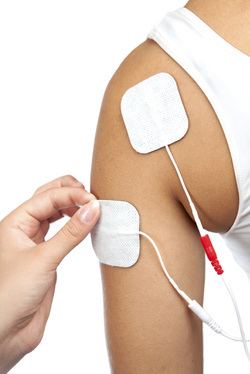 TENS and muscle stimulators use discrete electrical pulses delivered at low frequencies of 2-160 Hz per second. However, Interferential stimulators use a fixed carrier frequency of 4,000 Hz per second and also a second adjustable frequency of 4,001-4,400 Hz per second. When the fixed and adjustable frequencies combine (heterodyne), they produce the desired signal frequency (Interference frequency). Interferential stimulation is concentrated at the point of intersection between the electrodes. This concentration occurs deep in the tissues as well as at the surface of the skin. Conventional TENS and Neuromuscular stimulators deliver most of the stimulation directly under the electrodes. Thus, with Interferential Stimulators, current reaches to greater depths and over a larger volume of tissue than other forms of electrical therapy. When current is applied to the skin, capacitive skin resistance decreases as pulse frequency increases.' For example, at a frequency of 4,000 Hz (Interferential unit) capacitive skin resistance is eighty (80) times lower than with a frequency of 50 Hz (in the TENS range). Thus, Interferential current crosses the skin with greater ease and with less stimulation of cutaneous nociceptors allowing greater patient comfort during electrical stimulation. In addition, because medium-frequency (Interferential) current is tolerated better by the skin, the dosage can be increased, thus improving the ability of the Interferential current to permeate tissues and allowing easier access to deep structures. This explains why Interferential current may be most suitable for treating patients with deep pain, for promoting osteogenesis in delayed and nonunion fractures and in pseudothrosis, for stimulating deep skeletal muscle to augment the muscle pump mechanism in venous insufficiency, and for depressing the activity of certain cervical and lumbosacral sympathetic ganglia in patients with increased arterial constrictor tone. Although the thought of electrical impulses being sent into the body may seem frightening at first, all you really feel is a slight vibrating sensation. Unlike many drugs, Interferential devices have no known side effects.